Home »Promote Yourself»On-demand printers to the rescue. So you run a small design-shop and you need to drop-off some samples to a client. You wish you had a jacket with the name of your business. Or, the local chamber of commerce is holding a meet and greet for local businesses and you want to rent a table to generate some leads. You wish your staff had polo-shirts and hats with your company name and you wished you had pens and cups to hand-out. On-demand printers to the rescue! On-demand printers (also known as micro-printers) specialize in small runs. Whether its just 1 piece or 5 pieces, they can turn it around quickly and usually at a reasonable price. For reference, consider the cost of a printed T-shirt at Target. They are usually in that ball-park. These sites allow you to have your own logo printed on such things as shirts, caps, jackets, mugs, mousepads, magnets, buttons, bumper stickers, postage stamps, cards, calendars and the list just keeps growing. These sites will even let you upload your logo to see a “virtual” version of the selected product with your logo. Pretty cool! Your graphic in a digital format. How it prints will depend on the quality of the image. It is better to use a vector file (such as EPS, Illustrator, even Corel). Some sites will also use bitmap files (such as JPGs, GIFs and even PNGs). Digital Photos. You can also use digital photos. But remember, it will only be as good as the photos. Blurry photos made blurry prints. Exception — if you are just using text and do not care about the font, most of these sites will allow you to just “type” the imprint (what will be printed on the item). Now it’s time to compare products and prices. Be sure to look at the number of colors allowed, turn-over time and the terms for shipping. As you may have guessed, my current favorite is Zazzle.com, and I have a photoframd store-front there. 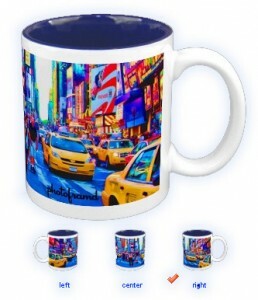 Zazzle has a great selection of products and their print quality is very good. Another favorite site is Mpix.com. Originally just a site for digital photography, Mpix has expanded their product line to include calendars, magnets, key-chains and more. If you are printing a photo, be sure to look at Mpix’s metallic paper. It is real Kodak photo paper with a metallic sheen that gives blues and greens a near-3D look. But, shop around yourself. Also, check retailmenot.com for coupons! ← Previous Previous post: Get your name out there! Next → Next post: Larger quantities means a real Promotional Product Distributor.